The stand out picture, shared countless times is of a barrister dressed in her wig and gown with her baby son on her shoulders – an inspiring and uplifting photo, reminding women of what we can all achieve and how far women in the law have come. 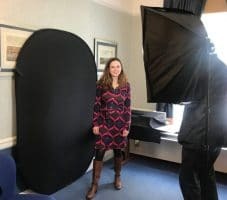 There was a great atmosphere at the photoshoot which I went along to a few weeks ago, with queues of women lining up at the Law Society in London to have their pictures taken. There was a sense of occasion with whole teams coming down from firms across London and people getting to know each other as they waited. At the same time, women in Cardiff, Edinburgh and Belfast were also attending photoshoots. It’s great to see such a positive campaign engendering pride amongst women in the profession. This is an important year, celebrating 100 years since women were allowed to practice the law. It’s a great project to be working on and I’m looking forward to being involved in events planned for the rest of the year.